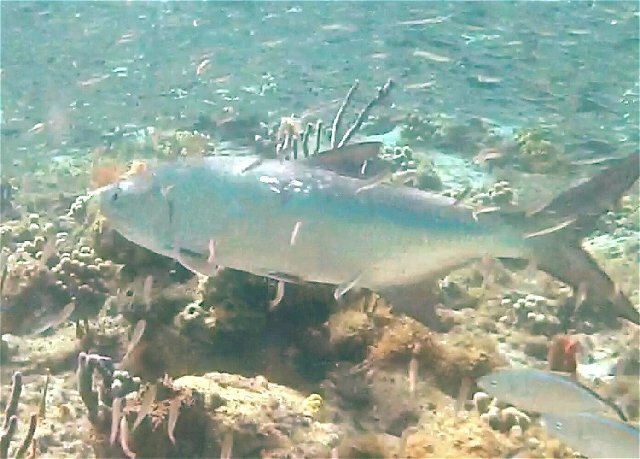 Video showing Tarpon fish in their natural environment. This was filmed while snorkeling in the British Virgin Islands. Atlantic tarpon are a large popular game fish often found in the warmer Atlantic waters in the Gulf of Mexico, around Florida, and the Caribbean. Adult tarpon can reach lengths of up to 8 feet and weigh over 200 pounds. Sport fishing for tarpon around Florida is incredibly popular. Their large size and strength makes tarpon fishing a very physical sport. Tarpon fishing tournaments are commonplace all over Florida. Although tarpon are popular to catch, the meat is not desirable and usually not eaten, so they are mainly catch and release game fish. There is one living genera of tarpon, megalops. Megalops most likely originates in the Miocene, as no publications of the occurrence of these genera before the Miocene could be found. Today, there are two species of megalops, one Atlantic species, and one Pacific species. The Pacific species is called megalops cyprinoides, and the Atlantic species is called megalops atlanticus. Both species live in near shore environments and live both in salt and brackish waters. According to the FMNH tarpon have a unique modified air bladder that allows them to breathe air from the atmosphere and live in oxygen poor waters. Extant tarpon are large fish. The Atlantic species can reach sizes of 250 cm, or 98 inches (marinebio.org), while the Pacific species can reach sizes of 150 cm, or 59 inches (Fishbase.org). The most common fossils of Tarpon appear to be their vertebra. The vertebrae superficially resemble a shark�s vertebra. As they both look like a shortened cylinder with a concave top and bottom. However, tarpon vertebrae seem to have a more oval shape than shark vertebrae. Also parts of the processes are usually still present on tarpon vertebrae, whereas shark vertebrae almost never have the processes attached. The image below shows an example tarpon vertebra (megalops cf m. atlanticus) from the Miocene Calvert Formation of VA.
During the winter of 2009 I was fortunate enough to encounter associated fossils from a tarpon (megalops cf M. atlanticus). 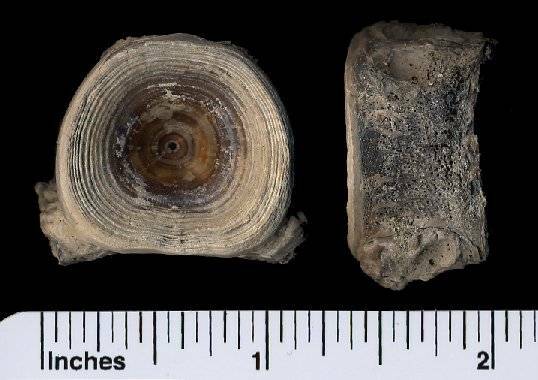 The specimen came from Shattuck's Zone 14 of the Calvert Formation in VA, which is Miocene in origin. It looked like the specimen was normally under water, however a very low tide had exposed the remains, which were now being battered by waves. Unfortunately it appeared most of the specimen had already eroded away. There were a few vertebrae left clinging to the matrix, and one washing in the waves. Also with the vertebra was a piece of bone, which appears to be skull material. Below are some images of the find. This is the specimen as found. Here is a closer view of the specimen. This is the find after being prepped. I left one vertebra in the matrix for verification of the Zone. Here are the side views of the vertebra. The side views of the vertebra in matrix cannot be shown. megalops cf M atlanticus (Valenciennes, 1847), megalopidae gen. et sp. indet. Attempting to identify teleost fauna (bony fish, not sharks) can be challenging from the Calvert Formation, as most publications discuss the shark, cetacean, or land mammal fauna. Fortunately, at Aurora, the Pungo River Units are based on Shattuck�s zones (Ward, p. 333) of the Calvert Formation. Also, since the cetacean fauna is remarkably similar to the cetaceans of the Calvert Formation (Whitmore and Kaltenbach, p. 257), and the shark fauna of each formation is nearly identical (pers. obs. ), the teleost fauna is most likely also very similar. Therefore, I turned to Pungo River fossils for identification. After perusing the Lee Creek III book, Purdy et. al, described vertebrae from Pungo River units 5 and 6 that were nearly identical to the ones I found. The author said they closely resemble the vertebrae of the living tarpon, megalops atlanticus (Purdy et. al, p. 162), and therefore called them megalops cf M. atlanticus. These are seven associated vertebra and a fragment of skull from a Tarpon. The fourth vertebra was left in matrix for verification of the Calvert Zone. Age: Early - Middle Miocene ~ 18-15 m.y. This is a vertebra from a Tarpon. Megalopidae genera et sp. indet. This is a fin spine fragment of fish from the Tarpon family. The genus is indeterminate. 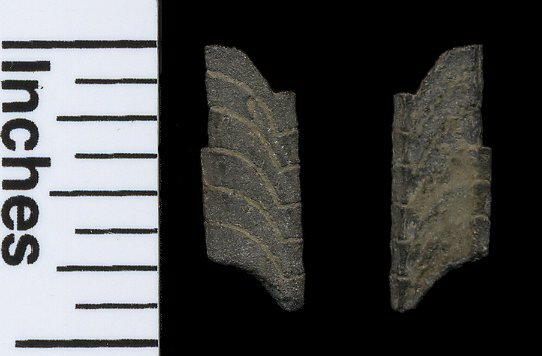 This specimen comes from Muddy Creek, VA.
Weems (Weems et al, 1999, p56-57) states this is a fin ray fragment. Weems says it can be identified by as a member of the megaloptidae family because "it is composed of multiple segments that are strongly torqued" (p.57). This intense torquing is only seen in the megalopidae family. However, he states the genera cannot be narrowed down because there are two genera of tarpon that occur in the Eocene, Promegalops and Protarpon (p.57). Spine fragments cannot determine to which genera the fish belongs.